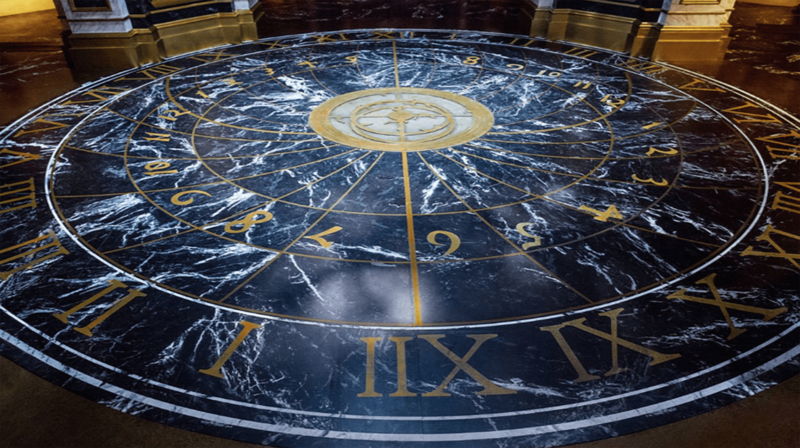 astrolabe in the center of the floor. I also wanted a bronze ring surrounding the ring on the floor underneath the dome and bronze markers for North, South, East and West quadrants. We talked about having it hand painted, talked about real black and white marble? Our amazing graphics man Brendan Hessle worked out the design on his computer and we ended up having all the black and white marble and symbols printed on giant sheets of sticky back vinyl. The bronze pieces of the center and outer ring were built out of wood and done as inlay into the floor. It worked because it only had to play for a week or so.